South Africa’s youthful new Minister of Mines, Mosebenzi Zwane. 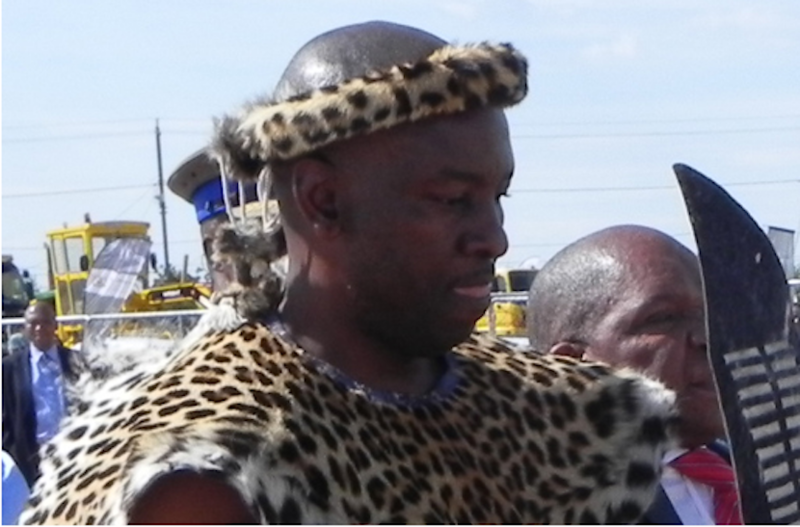 As this pic from the Free State provincial government’s website show, like his boss, President Jacob Zuma, Zwane is a traditionalist, not averse to wearing the warrior’s traditional leopard skin uniform in public. Johannesburg – A series of secret manoeuvres were undertaken for more than a month and culminated in the shock appointment of Free State agriculture MEC Mosebenzi Zwane as the new mineral resources minister last week. City Press can reveal that the first steps for Zwane’s redeployment were taken as early as the beginning of this month, when he mysteriously disappeared from the Free State cabinet of Ace Magashule. No announcement was made about his departure until a few days before he was announced as minister. Last week, it also emerged that Zwane was flown to Cape Town by Magashule’s office, catching off guard the troop of parliamentary officials who are usually involved when a new MP is to be sworn in. A source in the National Assembly Table (senior parliamentary staff) told City Press that officials in Parliament were surprised when Deputy Speaker Lechesa Tsenoli informed them that Zwane, the new MP, was already in his office. JZ has this genius of catapulting ppl from their well-deserved obscurity into the cabinet. Who’s Mosebenzi Zwane? It subsequently emerged there was a last-minute rejig of the party political list of those eligible to become MP. This was highly unusual, according to the source. “No one at the National Assembly Table was aware of a member who had to be sworn in. They normally obtain the information before the member even comes to Cape Town,” said the source. Zwane was nominated as an MP on September 2 and his membership of Parliament was announced by Tsenoli the next day. The announcement came as a surprise, as the provincial government had kept mum about the departure of the MEC from the province to join the National Assembly. The provincial ANC only issued a press statement about the provincial cabinet reshuffle on September 18, the day after Magashule appointed Zwane’s replacement in his cabinet and more than two weeks after Zwane had left the provincial government to become an MP. The Gupta-owned New Age newspaper ran a small item about his staff’s farewell party for him. The parliamentary source said logistical arrangements would usually be made with the necessary paperwork. Only then would the Speaker or deputy Speaker be secured to administer the swearing-in. “In this case, the man was flown to Cape Town by Magashule [his office]. “The table was informed by Tsenoli that there was a person to be sworn in, who was already in his office. “The table was taken by surprise. Even the list had to be quickly amended at Luthuli House so he was at the top so as to be the next in line,” added the source. The appointment was “a shock”, said an ANC national executive committee (NEC) member. “We were aware of his presence in Parliament over the last few weeks and anticipated that he was being positioned for a Cabinet post,” said the NEC member. Parliament denied some of the allegations. Its spokesperson Luzuko Jacobs said “the relevant authorities at Parliament were aware of the nomination and swearing-in well in advance”. Jacobs said where requested by the ANC, Parliament would perform the logistical arrangements like organising flights and accommodation for a new MP, but that there was no such request from the party in respect of Zwane. “For example, this happens in instances where a new member is already in Cape Town,” he said. Speaking to City Press, Zwane said he deserved a fair chance. “I have been listening to people asking who am I and where I come from to a point where people want to say I was appointed because I am linked to any other person. I think in all fairness, people should pause and learn to ask if they do not know a person [Zwane]. “I come from the ranks of the ANC, I have not just emerged. I have been with this organisation for more than 20 years. As we speak, I am the provincial treasurer. Zwane denied that he was appointed by President Jacob Zuma because he had links to the Gupta family, who have interests in mining. “There is no link with those people that makes me become a minister. “As far as I know, if any minister has to be appointed, no other person from outside will influence the appointment. “Because, when I was called by the President to say, ‘I’m deciding to give you this opportunity to make a difference’, I was not told that somebody had pleaded on my behalf. So I don’t know where this thing comes from. Zwane is facing at least one Public Protector investigation, which relates to the undervaluing of his home in Warden in Free State, where he allegedly built his private home on municipal land. The DA in the Free State alleged that Zwane’s house was valued at R29 000 to avoid paying rates and taxes, while other houses in the area had been valued at R300 000. Public Protector spokesperson Oupa Segalwe confirmed that the office was investigating the matter.